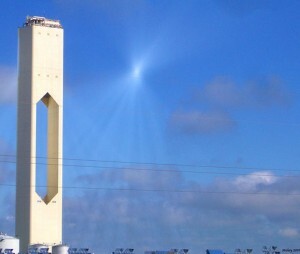 The clear skies and strong sunshine of southern Spain have helped deliver the world's largest solar tower plant. About 20 miles from Seville 1000 mirrors, each the size of a tennis court, have been connected to reflect sunlight and superheat water at a central tower. Using Concentrated Solar Power (CSP) technology, this leading project for utilizing renewable energy produces 20 Mega Watt of electricity. 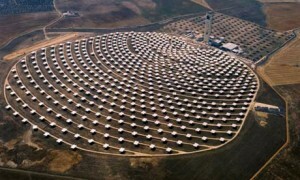 Finished being built this month, this project will product enough power to run 11,000 Spanish households. CSP is a cheaper and more efficient technology to collect solar energy than Photovoltaic (PV) panels but it only works in desert like conditions of cloudless skies and intense sunshine. 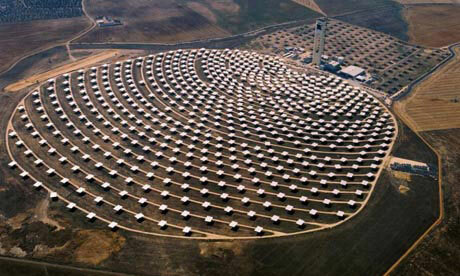 With more than 30 CSP projects underway in Spain the country is leading the way with this technology. José Luis García, from Greenpeace in Spain told the Guardian recently "CSP is at the very beginning of a big boom... Spain is in a good position to develop and implement the technology. We have the sun so we are in the best position to lead in this field." Companies constructing the CSP projects are exporting the technology to sun concentrated countries across the globe including Morocco and Algeria.